Dimensions 0.25 by 10.50 by 9.25 in. When the moon rises, frogs on their lily pads embark on an adventure in the air, providing young readers with different aerial perspectives in a humorous and imaginative fantasy story. Reprint. Caldecott Medal. SLJ. K. AB. PW. C.
A Caldecott classic celebrating twenty years in print. 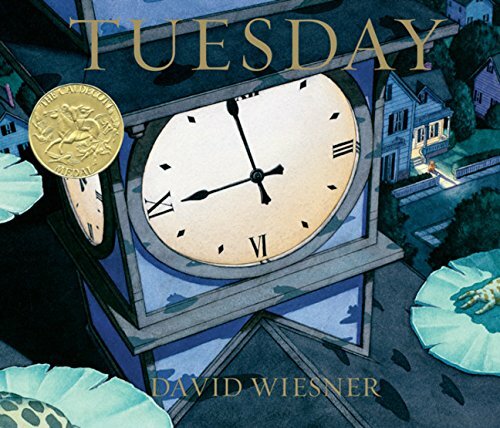 David Wiesner received the 1991 Caldecott Medal for Tuesday. In the years that followed, he went on to receive two more Caldecotts, and Tuesday went on to sell half a million copies in the United States and to be published in a dozen foreign countries. Now, with remarkable advances in the technology of color reproduction, the original artwork for Tuesday is being reproduced anew, for an edition even more faithful to the palette and texture of David Wiesnerâs watercolor paintings. The whimsical account of a Tuesday when frogs were airborne on their lily pads will continue to enchant readers of all ages. About: The unpredictable events of a particular Tuesday unroll before the reader with the precision and clarity of a silent movie.